So after a lengthy delay in Neyland’s draw in the Senior Cup, things moved on considerably this week. As a result of the outcome of the court case and subsequent action by the WWFA, it was resolved that Hakin United be excluded from the competition and therefore Neyland would play Merlin’s Bridge at the Athletic Ground. The fixture was played on Tuesday last with a crowd of some 200 supporters and players from the three teams which have already reached the semi-finals. It was a hard-fought encounter which didn’t really reflect the quality of either side – clearly the outcome was of greater importance, neither side wanting to make an error. It was a scoreless first half although The Nomads had slightly more chances than the Bridge. With 20 minutes remaining, Neyland won a corner and Mickey Chandler’s cross was met by the head of Nicky Koomen who fired home for the Nomads. And that’s how the game ended albeit that the homesters suffered a blow with Paul Hannon sustaining a seriously split eye which subsequently required 16 stitches. And so to the quarter final! And it was another home draw as Neyland entertained Haverfordwest Cricket Club from the 2nd Division on Saturday 18th. The home side was given a bit of a fright when the visitors went ahead in the 20th minute. However within 5 minutes, the Nomads drew level when Henry Durrant drove a left footed shot from the right side of goal. And within 10 minutes, Aaron McQuillan had grabbed two goals to put Neyland into a 3-1 lead at half time. During the second half, skipper Sean Hannon added a 4th closely followed by another from Wayne Vaughan-Parry. Then it was the turn of Mickey Chandler who let a left footed volley find it’s way to the top of the net. And finally Gary Power got a deserved goal to give the Nomads a 7-1 victory. 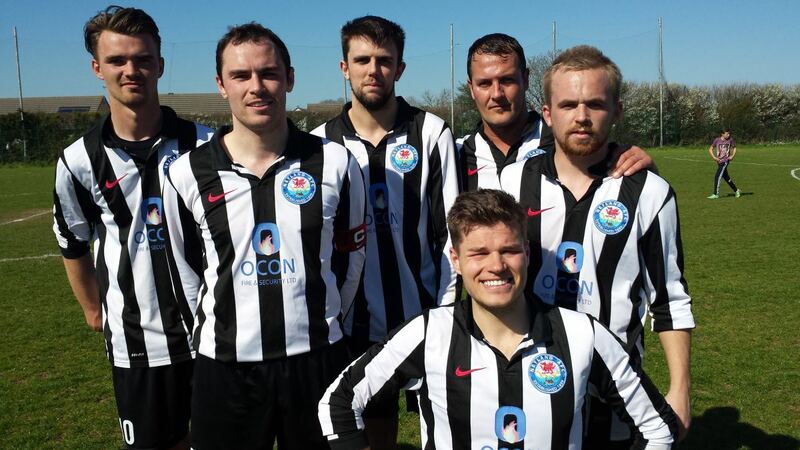 Next week they will be playing the semi final against Narberth at Monkton, KO 2.00pm. The club is looking forward to having a large contingent of supporters on the day. This entry was posted in Sports on April 20, 2015 by admin.